Memoirs of the House of Hewetson or Hewson of Ireland, John Hewetson, London, 1901. The Hewetsons of Kerry, Limerick and Suirville, County Kilkenny, Ireland, John Hewetson, London, 1911.
that is incorrect but maybe that is date of funeral. [Burkes Irish, 1976] shows Rev. Robert Hewson had younger sons. Robert's baptism 1813 shows he is son of Rev. Robert. Account of Robert Hewson (son of Rev. Robert Hewson), cleric, died unmarried in 1881. From p.133 of [Murphy and Chamberlain, 2011]. Rev. Robert Hewson was curate of Kilcolman (Milltown), Co.Kerry. [Houses of Kerry] says he lived at Kilburn House as at 1812. 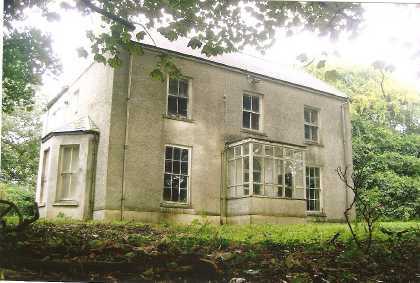 Later he would have lived at the The Rectory, Kilcolman (built 1820). 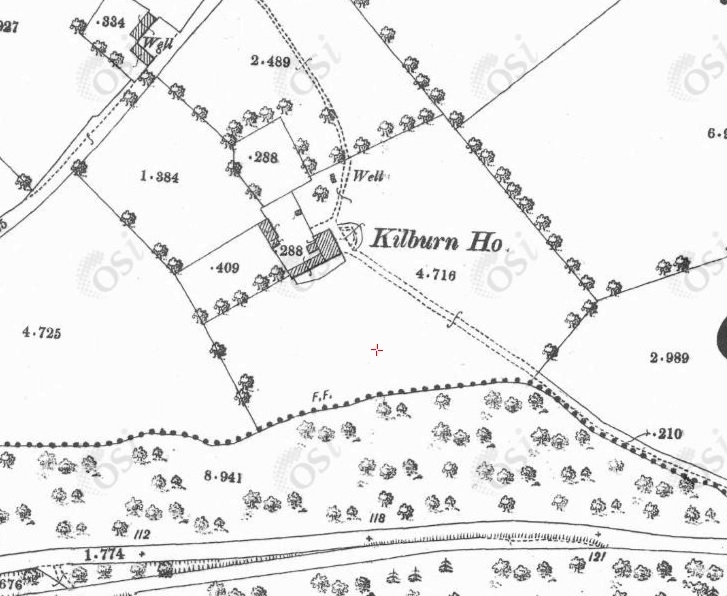 Kilburn House, W of Milltown, on 1887 to 1913 map. Now a B+B. See street view. 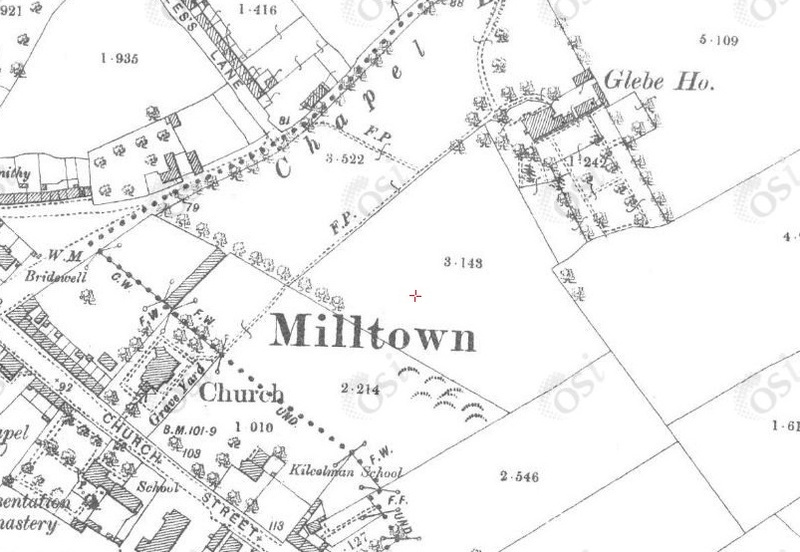 Kilcolman church and Glebe House (or "The Rectory") on 1887 to 1913 map. 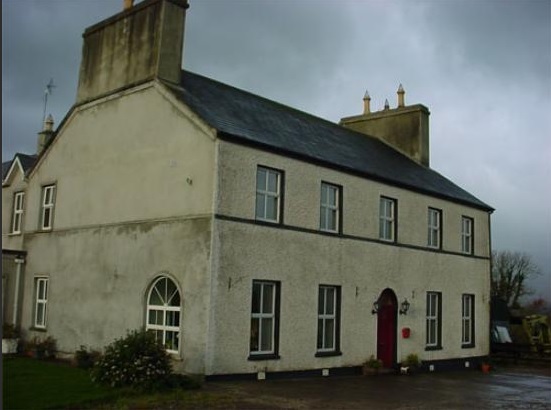 Glebe House, Kilcolman, for sale here. 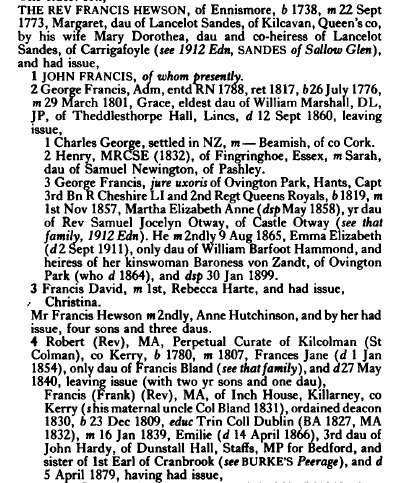 Hewson of Co.Limerick are closely related to Hewson of Co.Kerry above. See [Burkes Irish, 1976]. Their main seat was Castle Hewson, Co.Limerick. The rock star Bono is from a family of Hewson of Dublin. I have now proved that these are not related to Hewson of Co.Kerry, at least not by the claimed line. However, an article in the Irish Times, Feb 24, 1998, p.5, says Hewson of Castle Hewson are said to be related to Bono, and he once considered buying Castle Hewson.